The famous little hedgehog which got its fame from Sega Master System and Sega Genesis and beyond is celebrating his 20th anniversary and with that, Sega has released a new game on the Steam platform giving users the ability to relive some of the coolest game modes Sonic has appeared in over the years. 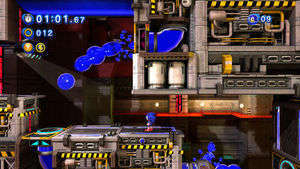 Sonic Generations supports both 2D and 3D game play with a ton of new levels and different games with Sonic. Just like Mario was for Nintendo is Sonic for Sega, except that Sonic's special weapon was his speed and Sonic Generations acknowledges that. The graphics of this game are spectacular and the cool 3D graphics are definitely worth it. Sonic Generations 1.0 is a shareware program and can be used as a demo to try the software until the free trial period has ended. A full version of the program is available after the trial period ends. For security reasons, you should also check out the Sonic Generations download at LO4D.com which includes virus and malware tests. Additional screenshots of this application download may be available, too. Sonic Generations has a presence on social networks. Sonic Generations download been highly rated by our users.